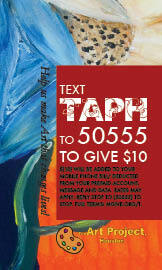 Text "TAPH" to 50555 to give $10 to the ongoing work of The Art Project, Houston of the Bread of Life, Inc.
supplies needed for a TAPH artist to create pottery to exhibit and sell. Your donation will enable us to continue providing art encounters, experiences and empowerment opportunities to meet the mental and emotional needs of the men and women we serve. Together WE will make a difference. Being on the streets makes you real tired, tired in every way possible. People who are homeless spend a lot of time alone and they kind of get into themselves and something has got to bring them out. Because we have to to stay in touch with the world around us and not just turn in. (In The Art Project Class) We get to talk about ourselves. We get to feel like we are apart of something again. When you come to these shelters you have a very disconnected feeling. We don't feel like you belong to anything, like you are floating. When you come in (Bread of Life, Inc.) and you participate in something, it becomes apart of you and you become apart of it.